This book review covers two books by the author Jenny Cockell. 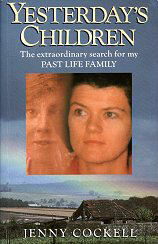 The first, entitled ‘Yesterday’s Children’, is auto-biographical, and describes the author’s extraordinary life story. Ever since her early childhood, Jenny experienced vivid memories of a previous life. During her earliest years as a child, she took it for granted that the rest of us all experience similar memories! It was a shock to discover that her experiences were far from common. Yet they seemed so real that they became a driving force in her life. Many people claim to have had previous lives. Perhaps what makes Jenny’s story so different, and so interesting, is that she set out to try and prove it. Her memories were vivid and detailed enough to piece together a profile of her previous incarnation. She managed to use that profile, together with the many recollections of time and place, to track down the family from her previous life. Hence the title of the book; ‘Yesterday’s Children’. Jenny Cockell writes with a certain intensity and purpose. She is absolutely convinced of the veracity of her claims, and that she has lived before. Indeed, she has experienced recollections from other lives further back in time; ones that are less easy to establish as factual. Nevertheless, her commitment to coming to terms with this aspect of her life gives the story a feeling of authenticity. Not only that, but the remarkable passage of events that leads her to meet ‘her’ children (themselves now somewhat elderly) is a fascinating account. She tells it well, particularly when working through the many emotional aspects of the story. 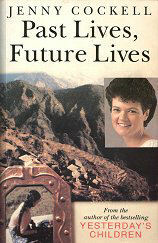 The second book, entitled ‘Past Lives, Future Lives’, is less preoccupied with the emotional trauma of it all. Written several years later, this book brings together various items of research purporting to substantiate the reincarnation belief. It delves more thoroughly into the memories of other lives; memories which Jenny Cockell frequently experiences. Further, though, it relates the equally startling phenomenon that is precognition. The author claims to experience moments of other lives which have not yet even begun, and at times seems to be adrift upon a sea of human experience spanning many centuries, both in the past and in the future. Clearly it is not possible to substantiate any kind of factual basis for these kinds of future memories, although Jenny researches Nepal in an effort to place these memories into some kind of context. This may be why this book draws in other research to give credence to the idea of reincarnation. Jenny Cockell’s first book contains evidence which speaks for itself; demanding answers from those inclined towards scepticism. The second book is more risky, in that it is more readily dismissible, and therefore could act to belittle the power of ‘Yesterday’s Children’. However, in the event, it is sufficiently balanced and well written to carry the reader deeply into the bizarre Twilight Zone of precognition, and perhaps even the world of a seer. I had heard about the remarkable story of Jenny Cockell before, but only came across these books through meeting one of Jenny Cockell's relatives, who recommended I read them. I’m certainly glad I did. I must declare a bias towards a belief in reincarnation, but I think that these books provide enough evidence to sway even mildly sceptical readers. I would recommend them to anyone wishing to explore the possibility that we may live more than once, and that the potential to experience those existences remains open to us in our present lives. Subtitled "The Extraordinary Search for my Past Life Family"